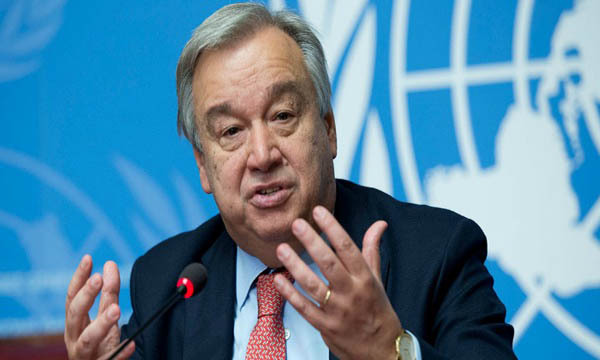 UNITED NATIONS, Mar 23 (APP):UN Secretary-General Antonio Guterres Friday called for an international action plan to help protect religious sites worldwide, during a visit to a New York Islamic center one week after the deadly shooting at two mosques in New Zealand. The secretary-general named Mian Naeem Rashid of Pakistan among the heroes who lost their lives while trying to save others. Rashid and his son Talha were killed trying to confront the white supremacist who attacked their mosque in Christchurch last Friday. Among the diplomats present in the mosque during the secretary-general’s visit was Pakistan’s Ambassador to the UN, Maleeha Lodhi. “Mosques and all places of prayer and contemplation should be safe havens, not sites of terror,” Guterres told namazis. The secretary-general met with namazis at the Islamic Cultural’s Centre’s mosque and offered “solidarity with the Muslim Community from New York to New Zealand and beyond”. Speaking to reporters, the UN chief announced that he had asked Spanish diplomat Miguel Moratinos with the drafting of an action plan for the United Nations to support efforts to protect religious sites.